Hind. Classical Flute Solo by Nash Neubert. Accompaniment Pt Kalinath Mishra(Tabla) Satyaprakash Mistra(Pakhawaj) Followed by Hind. Classical Tabla Solo Jugalbandhi Pt. Kalinath Mishra & Satyaprakash Mishra. 06.30 PM. Venue: Bhavan's Cultural Centre, Bhavan's College, Munshi Nagar, Andheri (W), Mumbai. R. Sridhar is a talented violinist who had shown immense potential from a young age. With able guidance under his gurus, V. S. K. Chakrapani and Akhila Krishnan, he has carved a niche for himself in the field of Carnatic music. An engineer by profession, he also pursues a career in music. P.S. Admission on a first-come-first-served basis. NCPA Members will get preferential seating till 6.20 pm. Venue: NCPA - Little Theatre, Nariman Point, NCPA Marg & Dorabji Tata Road, Mumbai. Dancing Music by Sudha Raghuraman. Accompanists: Shri G. Raghuraman on flute and Shri P Padmanabhan on mridangam Her lec-dem will look into how music for dance is an art by itself and how musicians accompanying dance form are trained especially for this purpose Sudha Raghuraman hails from a family of distinguished musicians. She is a sought after singer of Delhi and is recipient of the noted Ustad Bismillah Khan Puraskar by the Sangeet Natak Akademi. 06.30 PM. Venue: India International Centre, 40, Max Muller Marg, Lodhi Estate, Delhi. Tabla Recital by Mohd Amjad Khan, disciple of Ustad Akram Khan from Ajrara Gharana, followed by Hindustani Vocal recital by Zubair Niyazi, disciple of Ustad Karim Niyazi, accompanied by Rasheed Niyazi on Tabla. 07.30 PM. Venue: Epicentre, Apparel House, Sector - 44, Gurgaon. Rabindra Sangeet by Kamalini Mukherjee. Collab: Impresario India. 07.00 PM. Venue: India Habitat Centre, Lodhi Road, Delhi. Hindustani Vocal Recital by Mohsin Ali Khan from Delhi, son and disciple of Ustad Abdul Sami Khan and Ustad Amir Ahmed Khan. 06.30 PM. Venue: India International Centre, 40 Max Muller Marg, Lodhi Estate, Delhi. Hindustani Classical Vocal recital by Mohsin Ali Khan from Kirana Gharana, disciple of Amir Ahmed Khan. Collab. India World Cultural Forum. 07.30 PM. Venue: Epicentre, Apparel House, Sector 44, Gurgaon. Sitar Recital by Satyaki Sengupta from Kolkata, disciple of Pt. Soumitra Lahiri. 06.30 PM. Venue: India International Centre, 40, Max Muller Marg, Lodhi Estate, Delhi. The Indian Music Group, St. Xavier's College presents a Classical Music Concert- 'May Concert', featuring Shri Atindra Sarvadikar (Vocals) and Shri Vivek Joshi (Sarod). About the artists: Shri Vivek Joshi - Shri Vivek Joshi received his initial sarod training from Shri S. B. Prabhu Tendulkar. He then trained under the guidance of Pandit Kishanlal Saigal of the Maihar gharana. Specialising in Layakari, he has been working on the role played by classical music in healing and reducing stress. 4.00 PM. Venue: St. Xavier's College, Mumbai. 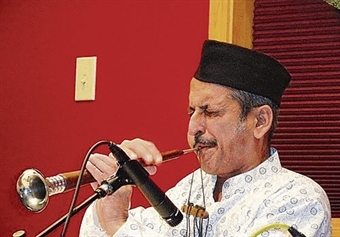 In memory of Lt. Ustad Amir Khan Sahib- Hindustani Vocal recital by Vijay Satre. Followed by Sarangi recital by Pt. Ghanashyam Sisodia. Collab: Swar Samarpan. 07.00 PM. Venue: India Habitat Centre, Lodhi Road, Delhi. Hindustani Vocal Recital by Upama Roy Sharma. Followed by Sitar and Sarod Duet by Arup Ratan Mukerjee & Prabhat Kumar. Collab: Society for Action Through Music. 07.00 PM. Venue: India Habitat Centre, Lodhi Road, Delhi. Hindustani Vocal Recital by Poorvi Parikh. 07.00 PM. Venue: India Habitat Centre, Lodhi Road, Delhi. Hindustani Classical Vocal Recital by Radhika Surana, disciple of Sarathi Chatterjee. 07.30 PM .Venue: Epicentre, Apparel House, Sector 44, Gurgaon. Hindustani Vocal Recital by Rita Ganguly, disciple of Pt Mani Prasad. Collab: Baba Allaudin Khan Music Foundation. 07.00 PM. Venue: India Habitat Centre, Lodhi Road, Delhi. Hindustani Vocal Recital by Pt. Arun Kumar Debnath, Dr. Sanghamitra Acharya & Riya Banerjee.Collab: Music Foundation. 07.00 PM. Venue: India Habitat Centre, Lodhi Road, Delhi. Hindustani classical Vocal Recital by Maitreyi Majumdar, disciple of Dr. Shanno Khurana. 07.00 PM. Venue: India Habitat Centre, Lodhi Road, Delhi. Hindustani Vocal Recital by Sonali Dutta disciple of Vidushi Sumitra Guha, followed by Hindustani Vocal Recital by Rajan Sijuar disciple of Pt. Rajan - Sajan Mishra. Accompanists - Jai Shanker Mishra (Tabla) & Kaushik Mitra (Harmonium). 07.00 PM. Venue: India Habitat Centre, Lodhi Road, Delhi. Guru Pranam Utsav 2014.Odissi Vocal Recital by Pt. Gopal Panda accompanied by Banmali Maharana and Sangeeta Panda followed by Hindustani Vocal Recital by L.K. Pandit.07.00 PM. Venue: India Habitat Centre, Lodhi Road, Delhi. Subah Ki Swaravali(Morning Ragas) - Hind. Classical Violin Performance by Padmabhushan Dr. N. Rajam(Disciple of Pt. Omkarnathji) Accompaniment: Ojas Adhiya(Tabla). 06.30 PM. Venue: Bhavan's Cultural Centre, Bhavan's College, Munshi Nagar, Andheri (West), Mumbai.